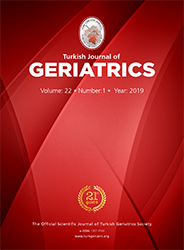 Turkish Journal of Geriatrics is a peer review journal focused on geriatrics and gerontology. The aim of the peer review policy is to maintain the objectivity, transparency, and quality of the Journal at the highest. The reviewer database (list) is frequently updated to meet the needs of the Journal. Authors are expected to declare and sign all kinds of documents regarding their manuscript steps if required (like conflict of interest, human an animal rights, informed consent, etc). For all the studies both conducted on human beings and animals as well as drug researches, ethical committee approval should be taken and a signed copy of "Ethical Committee Approval" should be send to the journal. The manuscripts will not be published without a copy of the “ethical committee approval. Authors should obey the rules in "Helsinki Declaration", "Good Medical Practice Guidelines", and "Good Laboratories Practice Guidelines". Technical Editor firstly checks if the manuscript is prepared according to the rules of the journal also if all the necessary documents are uploaded to the system (These are: A copy of “Ethical Committee Approval” for researches or a copy of signed "Informed consent form" for case reports, "Contribution Form" signed by all authors. for case reports, "Copyright Release Form” signed by all authors). And checks also if the manuscript fits to the scope of the journal. If all technical rules are met by the manuscript, the Editorial Process begins. Time needed for the reviewing process can change due to the reviewers’ responses. Usually minumum two referees experienced in the field evaluate the article. When a contradiction occurs, more referees are invited that are included in the system and this can extend the process. When feedback of all of the reviewers end, the authors are systematically informed and given time to correct their manuscript(s). As soon as corrections are received, the Editors can either send the corrected manuscripts to the reviewers (in case of their declaration of re-review process) or can give the decisions.